BAsics concentrates more than 30 years of Avakian's work. BAsics can not only introduce many more people to the thinking of the author who has put communism back on the agenda as a vital and viable force—it can play a major role in bringing forward and forging a new wave of revolutionaries. To look at the table of contents is to look at the key questions that present themselves to someone agonizing over the question of whether and how they can actually change the world in a fundamental and meaningful way. 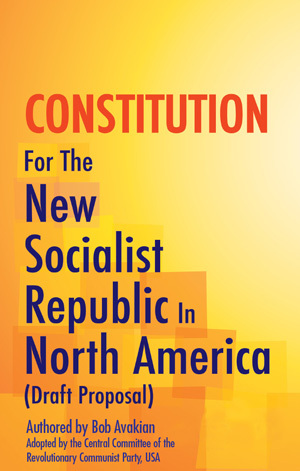 This compilation of selected writings from Bob Avakian, Chairman of the Revolutionary Communist Party, USA including excerpts from the Constitution for the New Socialist Republic in North America (Draft Proposal) brings a truly unique perspective to a subject that is of critical importance for all those concerned with social justice: Constitution, law, and rights. 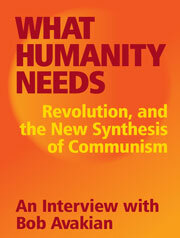 At the beginning of 2012, an in-depth interview with Bob Avakian, Chairman of the Revolutionary Communist Party, USA, was conducted over a period of several days by A. Brooks, a younger- generation revolutionary who has been inspired by the leadership and body of work of Bob Avakian and the new synthesis of communism this has brought forward. From the outset and through the course of this interview, Brooks posed probing questions, dealing with a wide range of subjects, including: the challenges of building a movement for revolution in a powerful imperialist country like the U.S., and initiating a new stage of communist revolution in a world marked by profound inequalities and antagonisms, and repeated upheavals, but also the weakness of communist forces at this time; the content of the new synthesis of communism, its vision of a radically different and emancipating society and world, and how this applies to many different spheres of society and social life, such as art and culture and intellectual inquiry and ferment; previous historical experience of the revolutionary and communist movements; and the personal experience, as well as broader social experience, which led Avakian to become a communist and contributed to his development as a communist leader. The fact that Avakian did not know in advance what the questions would be, and that many of them came up through the course of the interview itself, adds to the liveliness of the interview and the living sense of the method with which Avakian digs into, examines from many angles, and "breaks down" the kinds of far-reaching and often complex questions which were posed in this interview and which have to be grappled with in confronting the challenges of radically transforming the world through communist revolution. Bob Avakian takes on the ideals of Jeffersonianism, and convincingly locates even its “loftiest aspirations” in social relations of exploitation and oppression—the social relations out of which those ideals grew, and which they served and continue to serve. In doing so, he draws on a wide range of scholarly research and polemically takes on major contemporary defenders of Jeffersonian democracy. Avakian demonstrates why and how these ideals of democracy co-existed with—and, indeed, arose on the basis of—the enslavement of Black people and the deep embedding of white supremacy into the body politic and ideological psyche of the U.S. But he goes further: not only showing why events turned out that way, but why those ideals themselves could only and can only generate and serve relations of exploitation and the division, and polarization, of people into antagonistic classes... into oppressor and oppressed. Moreover, he convincingly points the way to a vision and future that is truly emancipatory—to a vision of freedom far more radical and thoroughgoing than anything imaginable within the constricted horizons of Jeffersonianism. 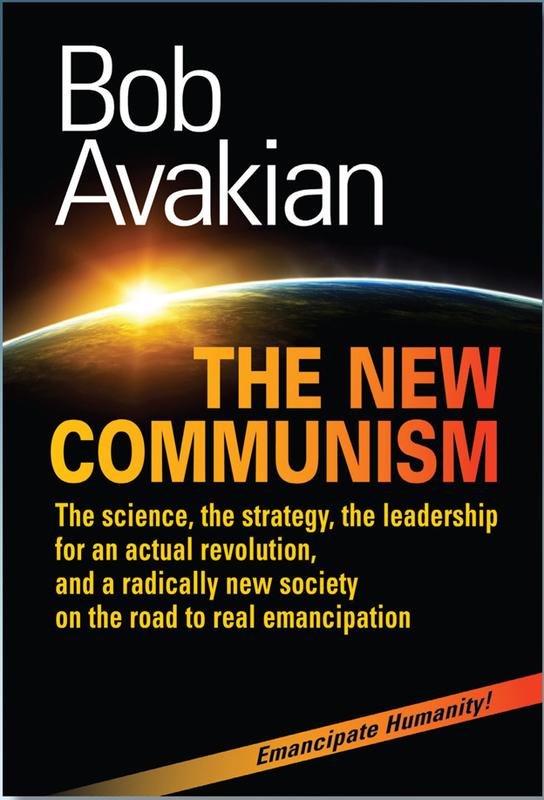 In doing this, Avakian includes a devastating critique of the “free marketplace of ideas,” contrasting it to a genuinely unfettered search for the truth—and he shows what kind of economic and political system would be necessary for that to flourish. Is believing in gods actually harmful? How has Christianity for centuries served as an ideology of conquest and subjugation? Why is the "Bible Belt" in the U.S. also the "lynching belt"? Why is there a rise of religious fundamentalism throughout the world? In the intensifying conflict between U.S. imperialism and Islamic fundamentalism, is the only choice to take one side or the other? Why is patriarchy and the oppression of women foundational to so many religions? Can people be good without god? 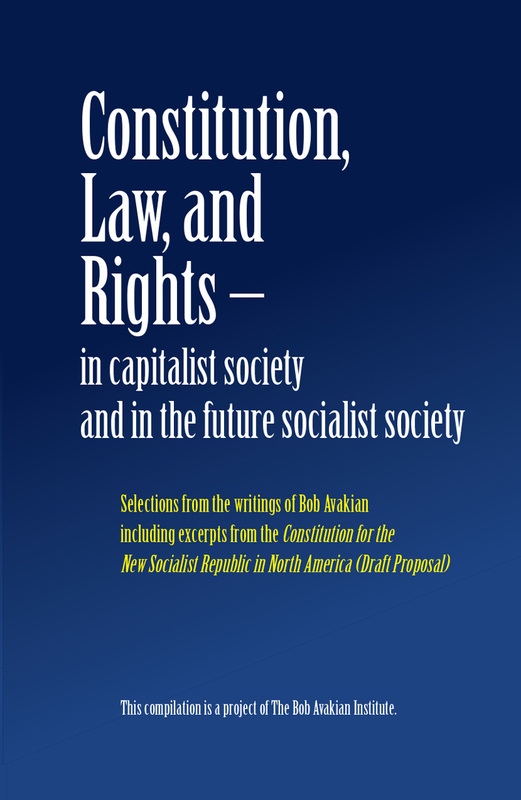 These are just some of the questions explored in this provocative work by Bob Avakian. 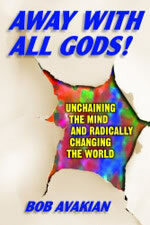 Bringing a unique revolutionary communist voice to the current discourse about god, atheism and morality, Avakian demystifies religious belief and examines how, even in its most progressive interpretations, religion stands in the way of the emancipation of humanity. A thread deeply woven throughout Away With All Gods! is the need to fully rupture with all forms of superstition, and to take up instead a truly scientific approach to understanding and transforming reality. Whether you believe in god, or are an agnostic or an atheist, Bob Avakian will challenge you with his powerful critique of long-established traditions and his liberating vision of a radically different world. 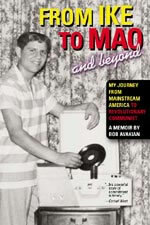 Bob Avakian has written a memoir containing three unique but interwoven stories. The first tells of a white middle-class kid growing up in ’50s America who goes to an integrated high school and has his world turned around; the second of a young man who overcomes a near-fatal disease and jumps with both feet into the heady swirl of Berkeley in the '60s; and the third of a radical activist who matures into a tempered revolutionary communist leader. If you think about the past or if you urgently care about the future...if you want to hear a unique voice of utter realism and deep humanity... and if you dare to have your assumptions challenged and your stereotypes overturned... then you won’t want to miss this book. This provocative collection of reflections and observations by Bob Avakian on art, culture, science and philosophy offers a rare treat. Excerpted from formal talks as well as more informal discussions and conversations, many of the texts in this collection allow the reader to experience firsthand the freewheeling Bob Avakian—in the process of developing his thinking and reenvisioning the communist project on a wide range of controversies, from the dictatorship of the proletariat to discussions of truth, beauty, science and imagination. This book offers readers a rare chance to witness a fascinating encounter between a radical social theorist and philosopher and a visionary communist leader and thinker. The challenging and unpredictable dialogue bristles with insights and provocations. Avakian and Martin wrestle with big questions that have to do with the state of the world and the possibility for radical change. The scope and relevance of Marxism, and the nature and reach of communist revolution, are at the heart of this rich and lively dialogue. This provocative book includes a scathing refutation of the reality behind conservative Christian fundamentalist morality, a critical look at the limitations of "liberation theology," including a discussion of Jim Wallis' book, The Soul of Politics, and an inspiring look at morality from a revolutionary perspective. This work is even more timely today as it was when it was published in 1999. Bob Avakian says in the Prologue that "From whatever vantage point one looks, it is unmistakable that there is what could be called a 'moral crisis' in America. There has been, to a significant degree, 'a breakdown of traditional morality.' But the answer to this—at least the answer that is in the interests of the majority of people in the U.S. and the overwhelming majority of humanity—is not a more aggressive assertion of that 'traditional morality' but winning people to a radically different morality, in the process of radically transforming society and the world as a whole." A bold and challenging book that cuts right to the debate of our times. Is capitalism the best of all possible worlds? Avakian contrasts the brutal realities of the free market to the claims of its defenders. Has communism proven to be a disastrous nightmare? Avakian refutes the charges that socialist economies are unworkable and that communism suppresses individuality and freedom. But he probes deeper, into the real history and lessons of revolution, especially the Maoist Cultural Revolution. Can revolutions survive in a hostile world? How can they avoid going sour? And is it really possible to move society beyond private gain and money relations? Bob Avakian shows that communism is both visionary and practical. If you want to know what real communism is about, and if you wonder whether society has to be run as a dog-eat-dog enterprise, then you will find this book as timely as it is provocative. Order Phony Communism Is Dead... Long Live Real Communism! Order Democracy: Can't We Do Better Than That?